Before you begin a moulding project, assess the area. Decide what style is best for the room. Collect sample pieces of different shapes (called profiles) and experiment with them. If single profiles font fit your decor, you can build up the moulding. This means you stack different profiles together to create a bigger or more artistic look. Often the first area of a room to receive optical scrutiny, the area where the walls and ceiling meets is a natural point to apply combination build ups. A combination crown build up takes the art of decoration to another level of design possibilities and creativity. A room with high ceilings calls out for a crown build up to create a visual passageway to the historical grandeur of European design. 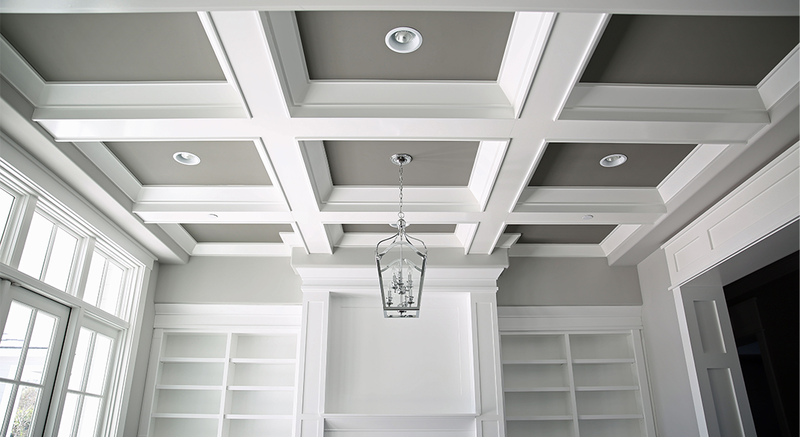 A room with standard ceiling heights may gain significant enhancement from a few simple pieces of moulding installed together to create a distinctive look and feel that will be immediately transferred to those that enter. Casings usually surround door and window openings and create a statement about the room’s character. Individual casing styles range from a contemporary style which emphasizes clean austere lines to a classic Victorian with ornate curves and profiles. By combining different types of casings you can develop unique blends of build up combinations. The only limitation is your imagination. Chair Rails were originally designed to act as a protective barrier against chairs being pushed back against the walls in dining rooms, kitchens, or game rooms. Nowadays, the chair rail serves a more decorative purpose rather than a practical function. There are a variety of stock chair rail profiles available from Alexandria Moulding but we encourage you to experiment with combining other diverse simple moulding profiles to develop your own build ups with your own personal style. A baseboard runs along the length of a wall on the floor to conceal carpet, hardwood or other flooring gaps or imperfections. In the past, before vacuum cleaners and other modern cleaning devices made their appearance baseboards served to protect against wet mops sloshing against the walls and damaging the plaster or drywall. Baseboard combinations are often one of the easiest fixes to add a dramatically different ambience to any room with the least amount of effort.